Boxwood Blight Detected in Ohio — Estate Landscaping & Maintenance Service, Ltd.
Estate Landscaping & Maintenance Service, Ltd.
REYNOLDSBURG, Ohio (Mar. 26, 2012)—The Ohio Department of Agriculture (ODA) today announced the discovery of boxwood blight at the Red Mill Farm of Losely Nursery in Lake County in northeast Ohio. Boxwood blight is a disease caused by a fungus (Cylindrocladium pseudonaviculatum) that threatens the health and sustainability of boxwood plants. This is the first detection of boxwood blight in Ohio. 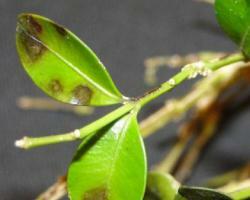 Boxwood blight was first detected in the United States in North Carolina in October 2011. Plant pathologists in the United Kingdom first identified the disease in the mid‐1990’s. It is unclear how the disease was introduced into the United States. To date, Ohio is the 10th state to identify boxwood blight. The suspect infection was reported to inspectors with the ODA and the Ohio Plant Diagnostic Network (OPDN) who then sent samples to the United States Department of Agriculture – Animal Plant Health Inspection Service (USDA APHIS) for confirmation. Officials at this time are unsure how the disease was introduced into the Red Mill Farm. ODA inspectors have issued a restriction on all boxwood plants located at the Red Mill Farm and will be conducting further sampling. “Although it is unfortunate to have confirmation on the farm, all known infected plants have been destroyed and we are working with the Ohio Department of Agriculture to prevent any further spread of boxwood blight” said Andrew Harding, Vice President and General Manager of Herman Losely and Son, Inc. This disease is spread primarily by water (rain splash, irrigation, runoff, etc. ), by the movement of plant material in the trade, and through contaminated tools, vehicles, boots, etc. Initial symptoms of the disease on boxwood plants include leaf spots and blights, rapid defoliation, distinctive black cankers on stems, and severe dieback. Most boxwood plants are not killed by the disease, but will become so defoliated as to be aesthetically unacceptable. Chance of snow showers early. Lows overnight in the low 20s. Sunshine and clouds mixed. High 29F. Winds NW at 10 to 15 mph. Partly cloudy skies in the morning will give way to cloudy skies during the afternoon. High 34F. Winds light and variable. Estate Landscaping & Maintenance Service Ltd.